This month it's "Fan Favorites" with Snakku! Lucky for me, one of my favorites was included and I just wish (once again) that there was a way to get more that didn't involve a plane ticket. 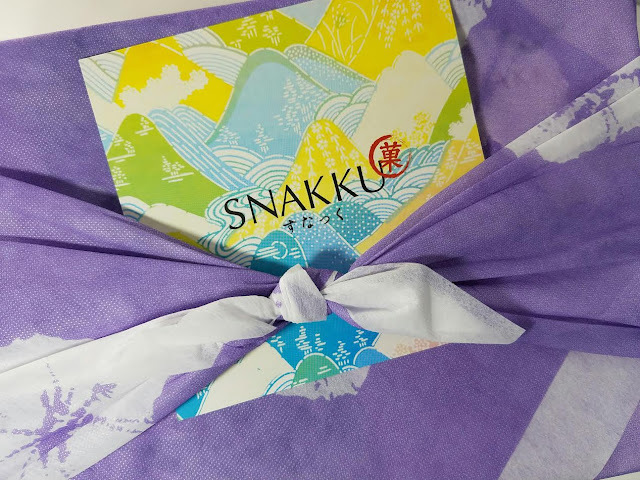 Snakku has been shipping directly from Japan which only enhances their committment to find high quality artisan snacks for every box. 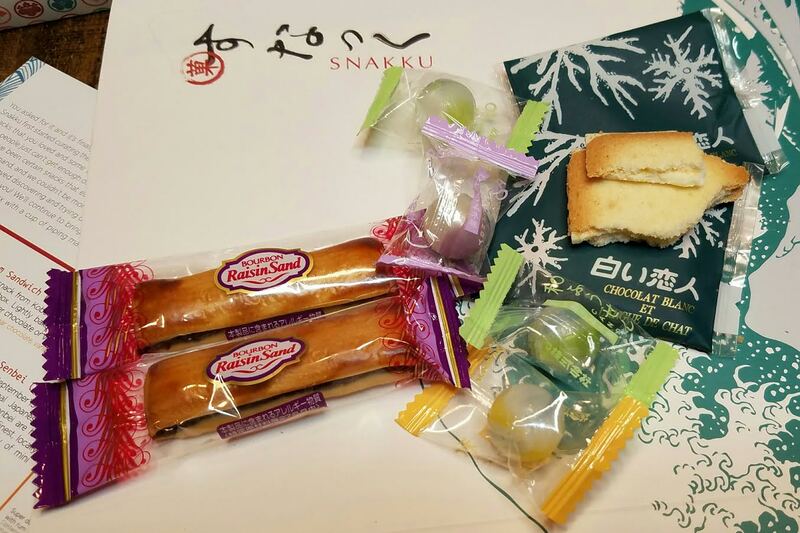 Snakku is more than just snacks, it's also an experience that makes a great gift. Each box is wrapped in a paper furoshiki cloth, giving it a wonderful presentation aspect. The box is artful and the information page is beautifully printed and includes photos of the snacks along with their descriptions. That's important when you can't read the language. Kobe Cream Sandwich- This is a delicate wafer pastry sandwich with a lightly sweet cream filling. It's light as air and absolutely delicious. 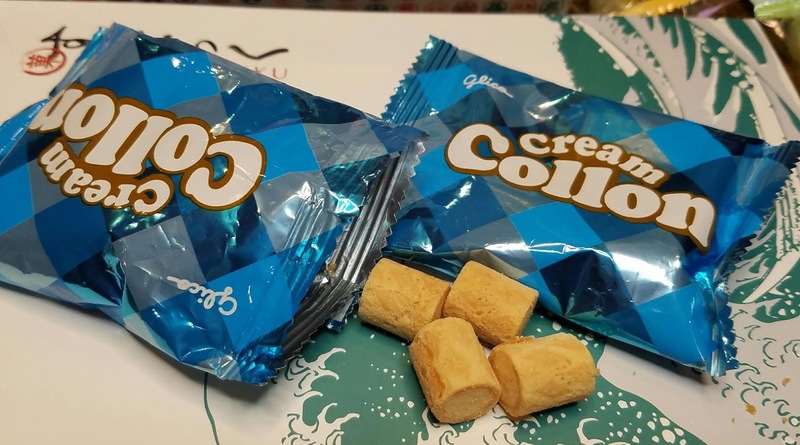 Two flavors included are vanilla and chocolate. 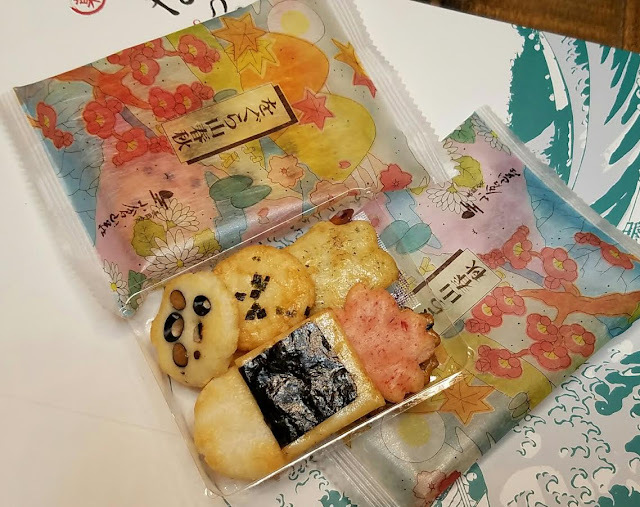 Ogurasansou Mini Arare Senbei- This is a collection of different flavored and shaped senbei. They're all very good and even have different textures as well. It's a generous variety. Bourbon Raisin Sandwich- Two puff baked cookies filled with rum soaked raisins. Japanese Ramune Soda Candy- Flavored grape, watermelon and lemon. Shiroi Koibito- An award winning cookie from Hokkaido, this is a layer of white chocolate sandwiched between airy butter cookies. So good! 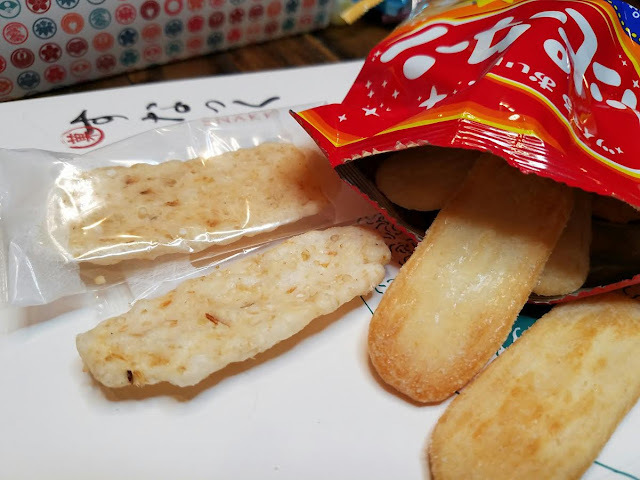 Yakitoukibi- I absolutely adore this snack. 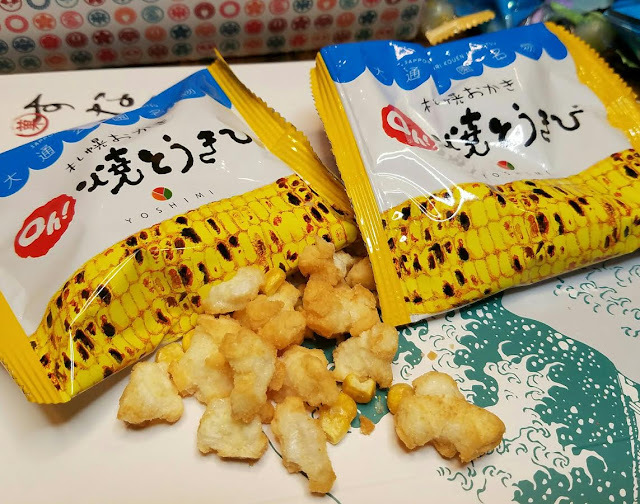 It's a sweet corn snack with puffy rice crackers. If only it didn't cost so much to ship here from Japan, I would buy 80 of them! 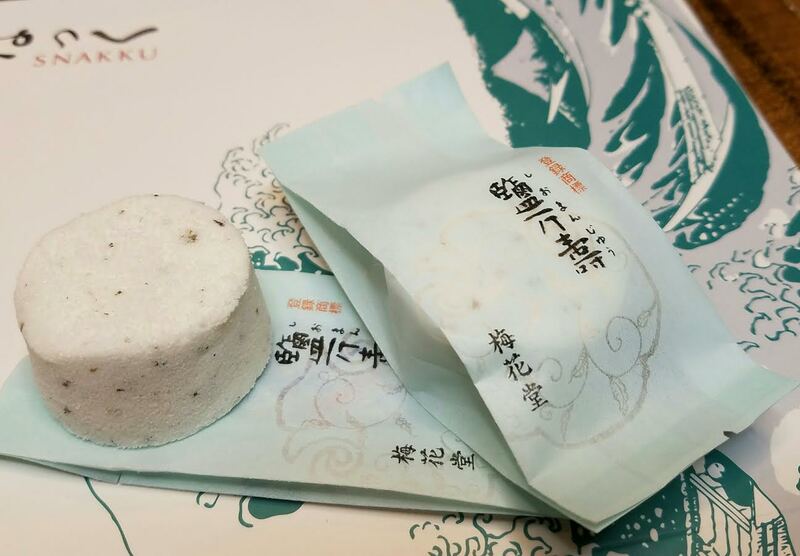 Shiogama- This snack is handmade by Buddhist monks using traditions passed down 400 years! So special! It's made from rice, basil and sugar then filled with red bean paste. Glico Cookie Rolls- These are wafer roll cookies filled with a light cream. They're very addictive. Shiro-ebi Brown Rice Senbei- Made with Japanese sweet shrimp. I gave these crackers to my husband because he loves shimp flavored anything and he enjoyed them. Happi Turn- These senbei rice crackers are both sweet and salty. They're very tasty! VERDICT: This was a fun box and I enjoyed getting some old favorites! Snakku does a great job of getting unusual yet authentic Japanese snacks and a few of the more common ones you might find. It's a great way to get Japan shipped to your door. It is expensive but if you're craving the good stuff, this is the way to do it! If you would like to sign up for Snakku, you can do that here. Use code BITSANDBOXES for 5% off your first box. 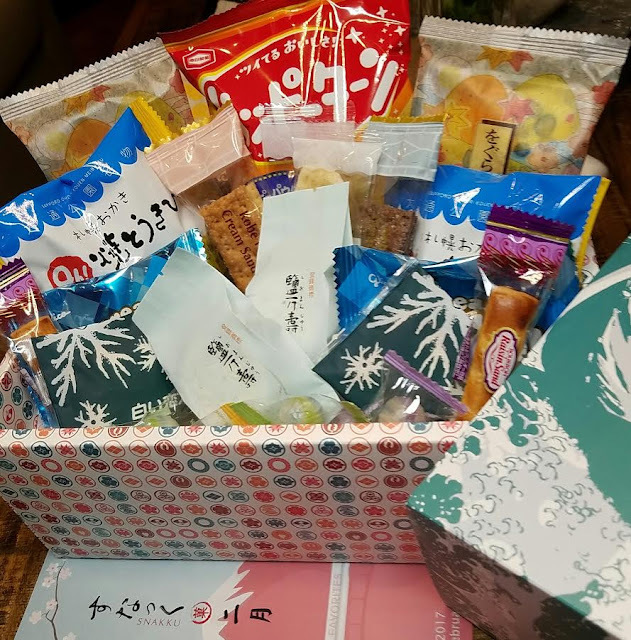 Do you love Japanese snacks? 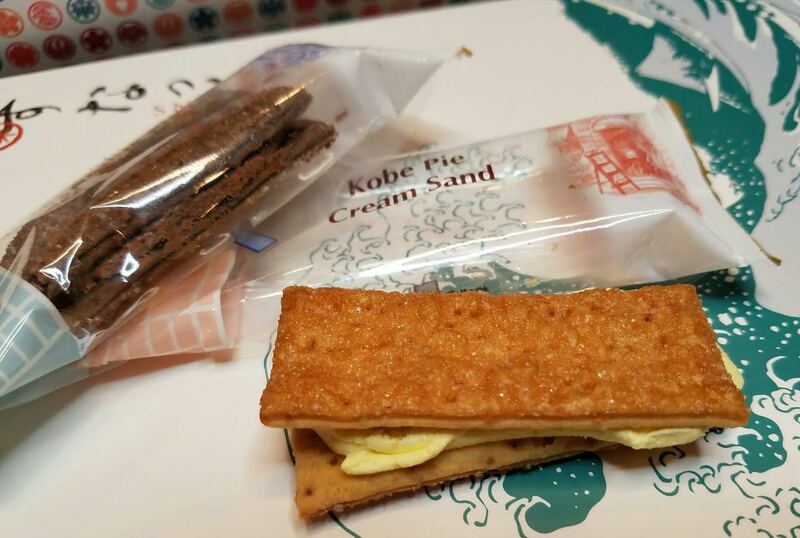 I can never have enough senbei, I have to admit.